Recommended, if you are seeking a book about how to cope with the world as an introvert or if you are the parent of an introverted child. This was a solid Self Help-ish sort of book. The author straddles the line between Self-Help, Psychology and Anthropology, as she discusses what it’s like being shy in a decidedly extroverted world. Self Help: The author describes how someone who is introverted can overcome their crippling social anxiety, such as by going to parties but never becoming the center of attention. The author is never condescending, but instead provides examples of how she controls her own anxiety and how her clients do the same. Anthropology: The author also does a good job of explaining the ways in which introversion can be superior to extroversion, from an evolutionary and cultural perspective. For example, great artists and scientists are more likely to be introverts because introverted people are more likely to spend time indoors alone practicing what they love. Psychology: The author cites research studies throughout the book, talking about how even from a young age an introverted person is more likely to be hesitant than their more gregarious peers due to fundamental biological differences located in their brains. 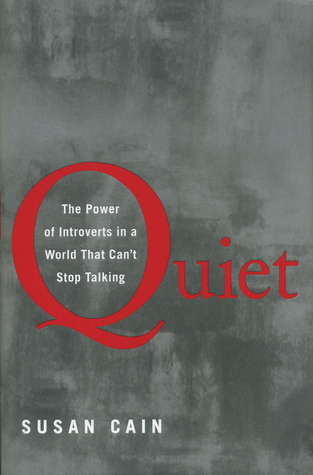 Now for some constructive criticism: I feel that at times the author oversold the value of introversion and undersold the value of extroversion. I agree with her main thesis that introversion’s value is massively undersold in our society, but she didn’t provide the counter-arguments to her own convictions. I think the book as a whole would have been better if she described the societal values of extroversion in detail in this book, instead of just glossing over them. Net total I do Recommend this book. If you are highly introverted, this is a Highly Recommend. This won’t be a book for everyone, even a lot of introverts, but for those it can help it will help a lot.